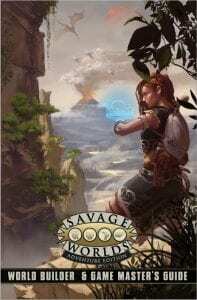 Savage Worlds licensee Amora Game recently launched a Kickstarter for their brand new Savage setting called Art of War. Art of War is an Eastern fantasy setting inspired by the Three Kingdoms of China and the Sengoku Period of Japan. It is the start of a new dynasty for the three Providences of the San Empire under a new Emperor. The three Great Clans bicker among themselves as the dust settles after an Oni invasion. 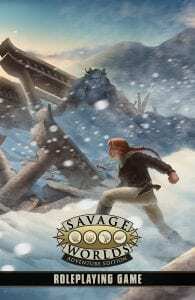 The land needs heroes to protect the people from hungry ghost, renegade bandits, encroaching Nagas, flesh-eating Oni, tyrannical feudal lords, and inter-clan territory skirmishes. Will you join the call and become a Legend? Influenced by anime, Art of War includes Tropes that act as frameworks to use as inspiration for the creation of heroes. 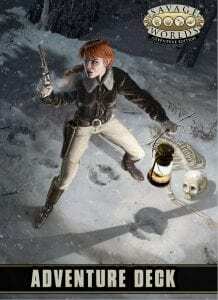 Tropes determine access to Chi Techniques, a point system similar to Powers in Savage Worlds. This allows characters to have one or two over the top specializations like Shadow Clone where you can momentarily create a double of the character, or Scorpion Sting that acts as though you have struck an opponent’s pressure points. The book also includes new Edges and Hindrances adapted to add some comedic relief, like Nosebleed, as well as a couple new Skills. 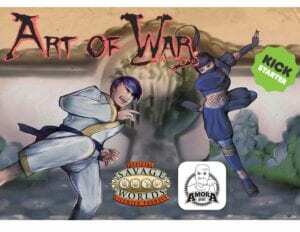 Focus your Chi and visit the Art of War Kickstarter page today for more info, a link to a PDF preview, and to pledge your support!